Suzuki has been a brand that has gone unnoticed for quite some time now, yes; we’ve seen the Swift and the SX4 but it didn’t really make any major waves in the South African car market... until now. 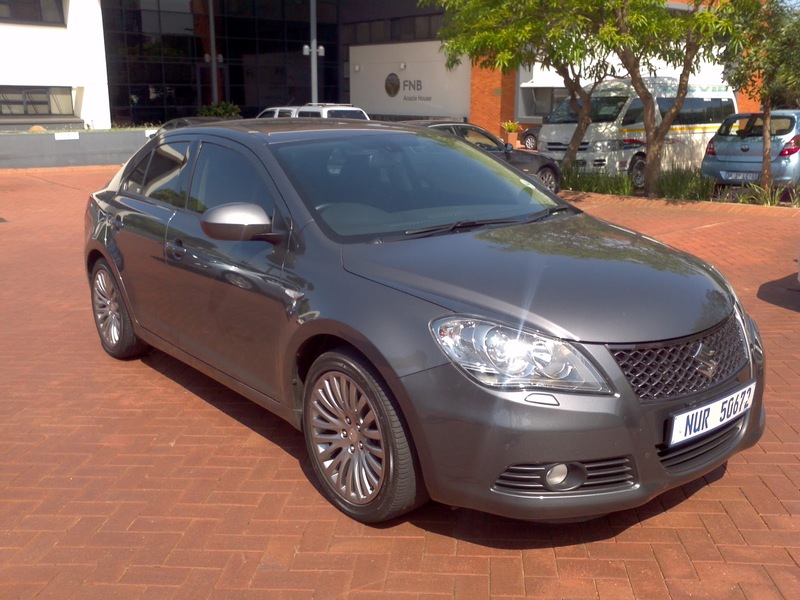 Let’s take a look at the Suzuki Kizashi and see what sets this car apart from its competitors. Gugu from our office just took delivery of a Kizashi, so without any delays we took it out for a test drive. As I approached the car I was taken by surprise at the aggressive sporty stance of the Kizashi, almost like one of those mob gangster cars you see in the movies. Bottom line is ... this car looks mean! I particularly like the 18” alloy wheels. The bonnet is a bit long to accommodate the 2.4 litre engine, which is the only engine size offered for the Kizashi. 131Kw and 230Nm of torque is derived from the 2.4 litre naturally aspirated petrol engine, rare stats for a mid-sized sedan, but which still manages to produce a combined cycle fuel consumption of just 7.9l/100kms. Suzuki’s secret to achieving this is their Continuously Variable Transmission (CVT). So Suzuki has managed to give you the grunt and growl of a bigger engine with low fuel consumption, unlike their competitors who have opted for small engines assisted with turbos. Inside, you will probably spend the better half of a day discovering all the features that the Kizashi has to offer. Just to mention a few, cruise control, dual climate control, auto seats with memory function, ipod ready 7 speaker sound system, PDC’s, sunroof..., the list goes on. But what I liked about it most, is that it is all finished with high end materials and designed big and bold, making operation a breeze. Another plus, is the boot size, even with its 461 litre boot size we were not short of leg room in the cabin. Out on the road, the ride was smooth and acceleration responsive. Handling was phenomenal, considering the size of the Kizashi. 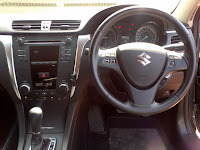 As I change my driving style on the highway I noticed that the CVT gearbox adjusted to how I wanted to drive, making gear changes constantly to deliver optimal performance and economy. It took some getting used to, at one point I had my foot all the way down and just when you expect the gearbox to change to a higher gear, it didn’t, but just kept accelerating! All in all it is a great package, priced at R327900 (2012), you may think that this is a tad bit high but if you consider all the features that you get standard, which are normally extras on other cars, I think it is worth it. Also included in the price is a 90000km service plan and 100000km or 3 year warranty. I thought that the warranty period was too short compared to competitors like VW and Toyota offering 4 to 5 years. Your article about 2012 Suzuki Kizashi is informative. It is really great work. Thanks for sharing your experience with us. I have bought Suzuki .It has won many honors. I am proud to be having one. Suzuki has good combination for space and power. It has high quality driving, good mileage, interior and exterior looks good. We really enjoyed driving this car . The result is that more people are trading in their used vehicles for new cars, leaving the used-car market with a glut of quality, pre-owned vehicles.